The Living Universe is a New Theory and Principle of the Absolute Circlon Synchronicity of Mass, Space, Time, and Gravity, and Their Measured Relationships Between Electrons, Protons, and Photons Within The Bag Bang Creation Story of the Cosmos. Circlon Synchronicity is Used to Depict the Creation, Evolution and Physics of the Cosmos in a Step by Step Journey from Beginning to End. The Living Universe Model Differs from the Standard Big Bang Model Only in that It Begins With an Eternal Duality, Instead of an Instantaneous Singularity. The History of the Cosmos is Explained Without an Aether or Any of Einstein’s Three Other Metaphysical Assumptions. 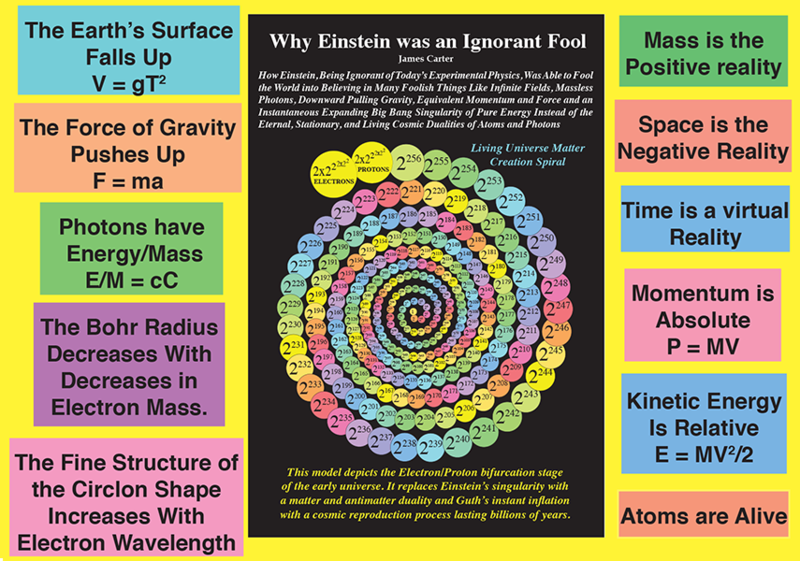 This is a Theory of Absolute Energy/Mass = C2 that is Equivalent to but is Upsidedown, Backwards, and Inside Out from Einstein’s Theory of Relative Spacetime, Mass, and Motion.